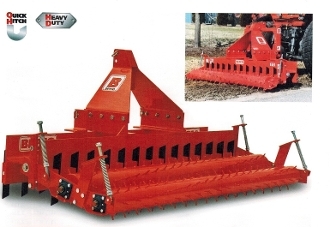 The Soil Pulverizers mount to the three point hitch of your tractor, and are used to scarify, breakup, smooth, and prepare dirt areas such as arenas for use, or to prepare rough dirt areas for primary seeding. These are our most heavy duty pulverizers, and are designed for the hardest use by construction and landscape construction companies. We have units for tractors up to 40 hp, and units for tractors up to 70 hp.